Occupying the site of a former railroad raper shop and holding over 90 pieces of retired historic railroad equipment, the Railway museum has several reports of supernatural occurrences. Volunteers speak of shadow figures inside the main building after hours and of a middle aged man haunting a passenger car housed in the main hall. The funeral car of President Warren G. Harding also has had sounds and figures seen aboard it and photos of orbs have been captured. 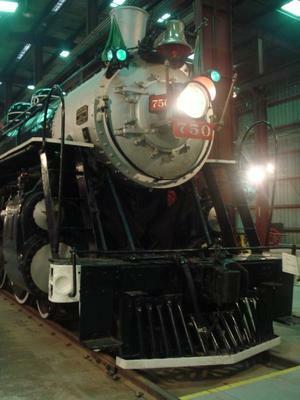 The sounds of locomotive bells ringing when the museum is closed is common. The property itself was also the site of the death of a railroad worker who was run over by a train late one night while it was still a railroad repair shop. Late night volunteers have reported seeing lights at the railroad switch where the man was killed and the tracks are very active with the museum's own train ride and the mainline. With all the modern day railroad activity It is not encouraged to be at this site without permission. Although it is highly doubtful if the two are connected, the Camp Creek Train Wreck of 1900 passed the museum site before it's fateful crash which resulted in the hunting of the local railroad line. At the very least 3 ghosts are known to reside inside the museum. However the possibility of more is very likely.